The panels are container elements similar to canvas but with several key differences – you can set their position, size and shape. The shape of a panel is defined by its panel border, a special element assigned to all panels. Every panel is an autonomous element with its own stack of layers which forms a composited image separated from other panels and canvas. The panels are usually used in comics. 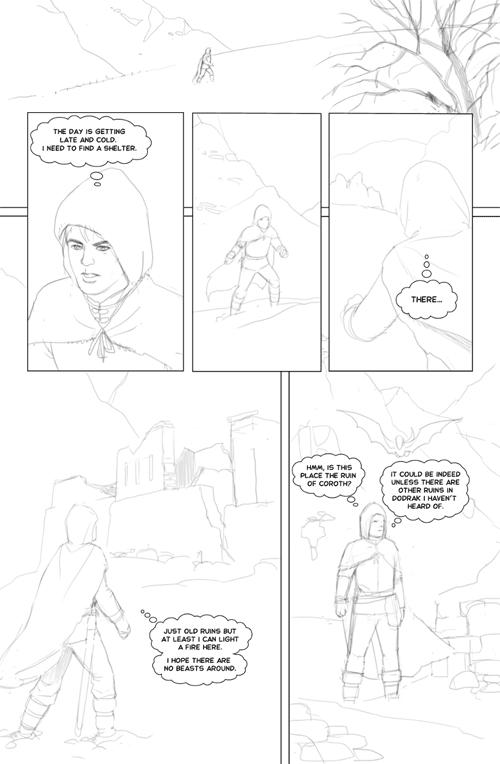 Here is a simple guide how a comic page was done. 1. 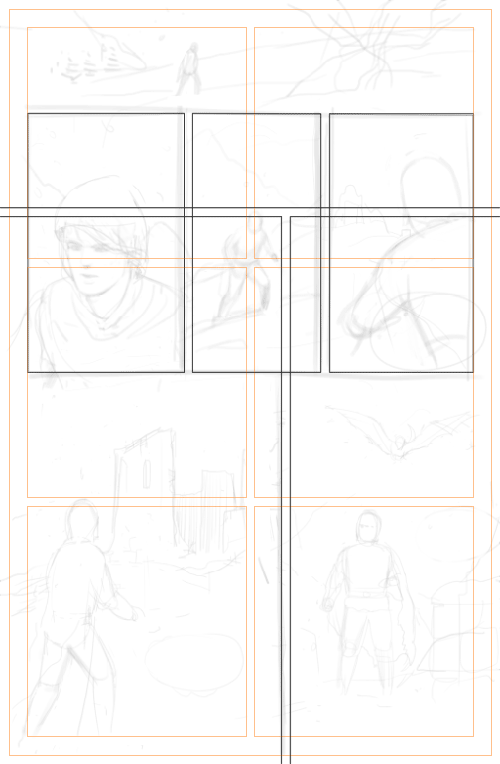 The first step is always designing the comic page layout. This is done by sketching the layout on the canvas. 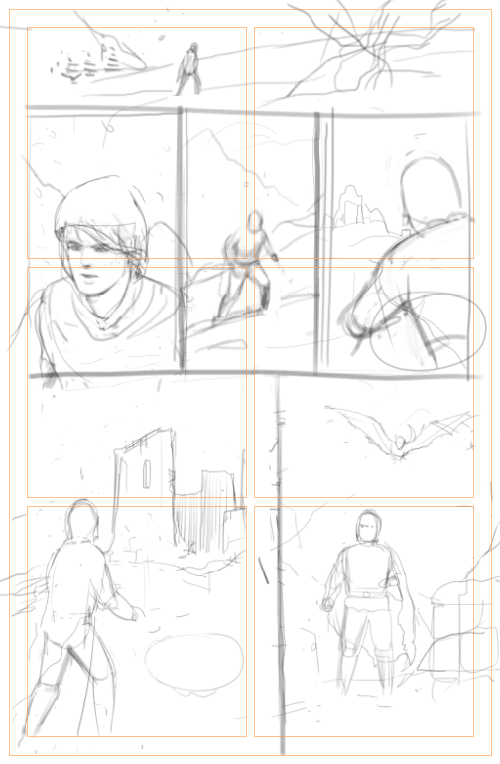 A layout should establish the content of panels and their shapes. 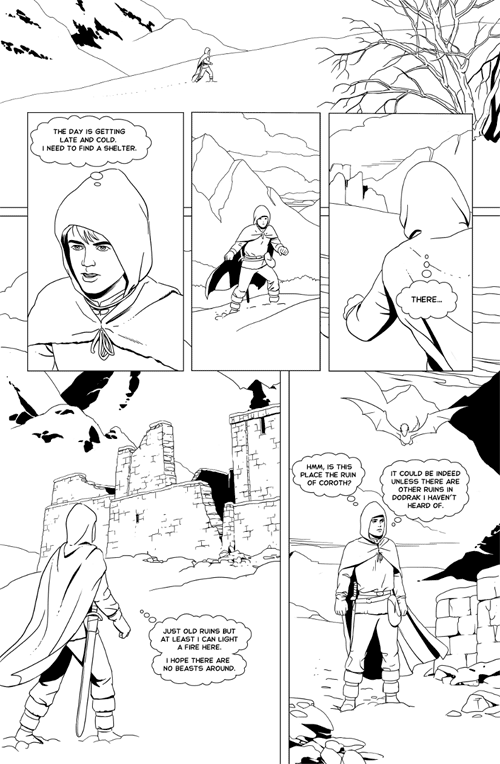 I used a preset comic image which has defined panel guides but didn’t really utilize them much for this layout. 2. I added a vector layer and draw rectangular polycurves for panel border lines. The Snap and Snap to panels guides parameters were enabled to allow quick and precise aligning of panels during their creation. The upper and bottom two rectangles extends over the canvas size, so they are not fully visible in the image bellow. 3. The panels were made with the menu command Panel(s) from Vector layer. This is a batch command which make panels with border lines from closed polycurves on the active vector layer. The panels are made in the same order as the polycurves and every panel automatically includes a layer with the composited image of the currently active panel or canvas. 4. I did pencil drawings for every panel using the pencil brush variant. When all pencil drawings were done I entered texts and draw balloons using grouped ellipse polycurves. At this stage I often reposition or transform drawings for better use of space – it is a good idea to have these things sorted out before inking. 5. The inking was done with the “Standard Pen” and “jugiPen”. The bucket color fill was used for filling in bigger black areas. 1) If you plan to work on more comics pages you should store your page dimensions and guide lines as a preset image item. Trim area or page size (for printed comics) – the size of a comic book page. The art that lies beyond that line will get trimmed off. Panels area or safe zone (for printed comics) – the area which is safe from getting trimmed off. Texts should lies within this area. Number of panels – this defines panel guides lines inside the panels area. Panels spacing – spacing between panel guide lines. The distance is also used for dummy lines parallel to the border lines in the snapping system in order to aligning panels to each other. 2) Use the panel expanding area when you want that the layers content reach over the panel border. There is always some empty space around the panel default rectangle which allow such modifications. If you need more space in the outside area you will need to make panel border deliberately smaller in order to get larger outside area. 3) If you need custom looking panel border lines you can change the panel border type to bitmap layer and then draw them with brush. However, doing so you lose benefits of vector based border lines like snap mechanics and automatic masking of the outside area. 4) If you have problems using the snap feature here is an explanation how it works. Click on a vertex of another vector shape (or panel border line, or comic page guide line). Click on a line of another vector shape (or panel border line, or comic page guide line) and the destination point will be restricted to that line. Click on another line intersecting the restricting line and the destination point will be at their intersection. You can change the restricting line by clicking on a line parallel to it or by clicking on a vertex belonging to the same shape as the moved vertex – this will offset the restricting line to that point. If you click in the outside area while the restricting line is active it will get cleared. Using dedicated panels for the comics may seem logical but you should use them only if you actually benefit from them. You may prefer to just draw all comic panels on canvas. The panels as separated elements have advantages but also disadvantages. They allow editing without affecting the other panels. But sometimes you want to affect more panels at once. An example would be when you need to adjust colors on more panels in the same way – if you use separated panels you need to adjust every panel separately. Add a vector layer at the top and draw one big rectangle polycurve extending over the canvas borders. Draw the panels border lines of all panels and group them with the big rectangle as subtracting shapes! This way they work as holes in the the big shape. Activate the color fill parameter for the big rectangle to hide everything in the border areas. To get the border lines of the three overlaying panels duplicate the vector layer and delete all panel shapes on it except those three which overlays. Clear the group and turn off the color fill to correctly render the border lines.